← Meet our new shorebird monitors! Green is the color that most of us associate with spring and early summer- but in some of the island’s conservation areas, black is the first color of the season. 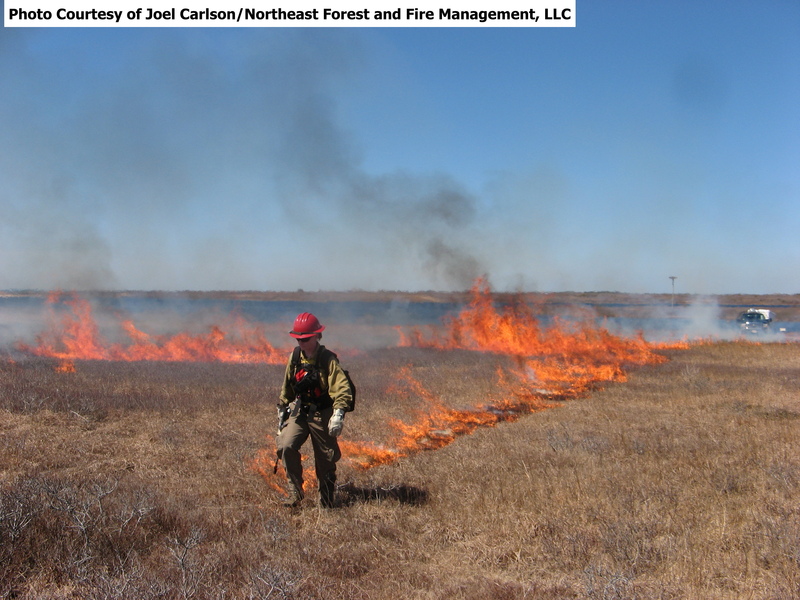 Spring and fall are when many open space managers in the northeast, including the Foundation, conduct an important ecological management practice called prescribed burning. As the name implies, a prescribed burn is the controlled application of fire to the land to accomplish specific conservation and/or land management goals. Although setting fire to the landscape may seem counter-intuitive to responsible stewardship, the majority of the vegetation communities found on our properties are fire-dependant. This means that the native plants and animals that they contain, some of which are quite rare, are dependent on periodic fires for their reproduction, growth and survival. Ecologists call these types of habitats “early successional communities.” They occur in areas where frequent disturbances – both natural and human-caused – take place. 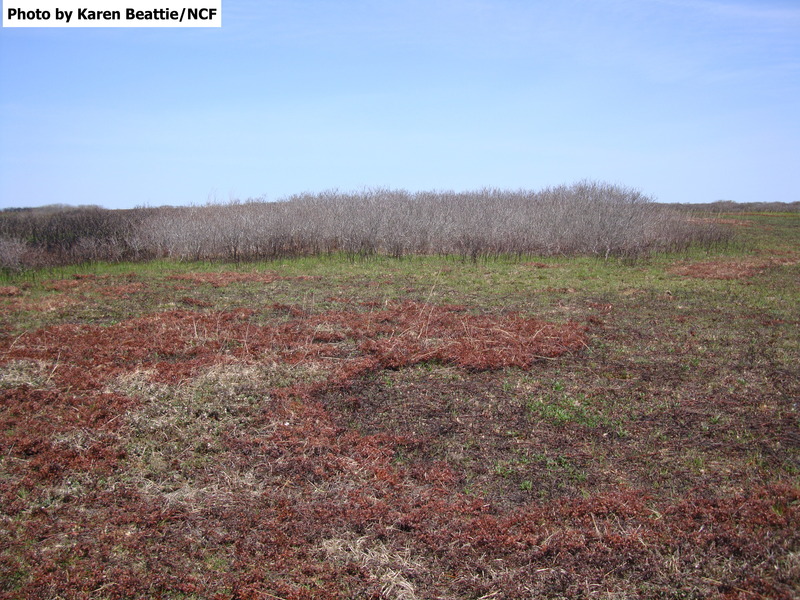 Nantucket’s early successional habitats include sandplain grasslands, coastal heathlands, and scrub oak barrens, all of which are designated as uncommon and exemplary “Priority Natural Communities” by the Massachusetts Natural Heritage & Endangered Species Program. They also help to define the unique and special character of our island’s open spaces. Anyone who is familiar with the island today will likely agree that this is no longer an accurate description of Nantucket. Virtually all of these activities have ceased over the last century, allowing tree and shrub species associated with forest habitats to expand into many areas that once contained early successional plant communities. As a result, our grasslands and heathlands have become quite rare and are now mostly limited to sites on the south shore of the island, including Ram Pasture, Head of the Plains, and Smooth Hummocks, where constant salt spray has slowed the encroachment of taller shrubs and trees. If left unchecked, even these habitats will slowly disappear, resulting in the loss of rare species. Some may say that this is a natural process, and that Nantucket’s early successional communities are themselves unnatural because they were created by historical human activities. While there is some validity to this argument, the increasing influence of people on the landscape has disrupted the natural processes that once allowed these habitats to be maintained without intervention. Prior to human habitation, grasslands and heathlands likely occurred as small, transient patches created by natural disturbances such as fires and hurricanes. As older patches became overgrown with shrubs and trees, new ones would be created elsewhere and the rare species associated with these places would persist. The situation today is very different. The historic range of these habitats along the coast of the northeastern United States is now heavily developed, leaving few open space locations for these natural ecological processes to play out. Nantucket is the exception, as we are fortunate to still have a great deal of undeveloped land protected by the Foundation and our local and regional conservation partners. For this reason, the largest, contiguous acreages of sandplain grasslands, coastal heathlands, and scrub oak barrens found in the country occur on our island. But in order for these areas to persist, we need to conduct management that mimics the natural processes and historic human land use activities that once maintained them. That’s where prescribed fire comes in. Fire is a natural and effective means of managing grasslands, heathlands, and shrublands. Many species associated with these habitats bloom profusely following burns, and some actually require fire to reproduce. Grasses, sedges, and perennial wildflowers are able to survive burns because they have extensive below-ground root systems. Although most shrubs are capable of re-sprouting after a fire, this management practice top-kills them, thereby preventing grassland and heathland species from being out-shaded. Birds and large animals such as rabbits and deer can easily outdistance the flames and find cover in adjacent unburned areas. Smaller animals, such as mice, voles and shrews, seek shelter in underground burrows where they can avoid heat. Burns are timed to avoid periods when birds are nesting and young animals are likely to be vulnerable. Although mowing and brushcutting can and often are used as an alternative habitat management practice, they result in a uniform impact over the managed area. In contrast, fire produces a patchwork of burned and unburned habitats due to the variability in its temperature, intensity and rate of spread. As a result, older, unburned plants are distributed within newly-burned habitat, thereby creating a mix of cover and forage conditions that benefit many species of wildlife. Fire also creates patches of bare soil that provide suitable sites for germination of grass and wildflower seeds, while mowing produces a dense layer of cut vegetation that functions as mulch and can inhibit seedling establishment. Prescribed fire has many benefits, but it is expensive to implement. It requires specially-trained personnel and high levels of pre-planning and coordination with other organizations and the Nantucket Fire Department. Liability, public safety risks, forecasted weather conditions, smoke management, and crew and equipment availability all need to be considered and responsibly addressed. 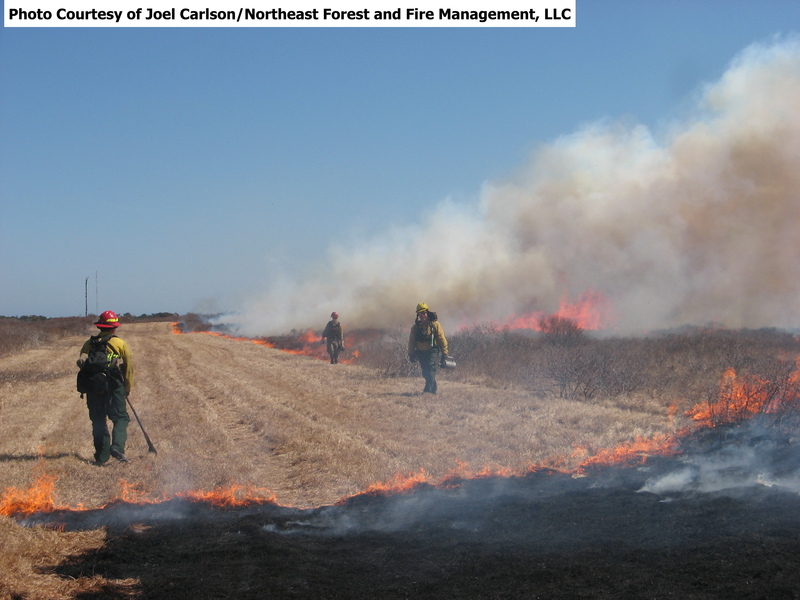 Despite these many obstacles, the extensive ecological benefits of this management practice motivate Nantucket’s open space managers to take advantage of the rare occasions when all the stars align correctly and we are able to successfully and safely accomplish a prescribed burn. 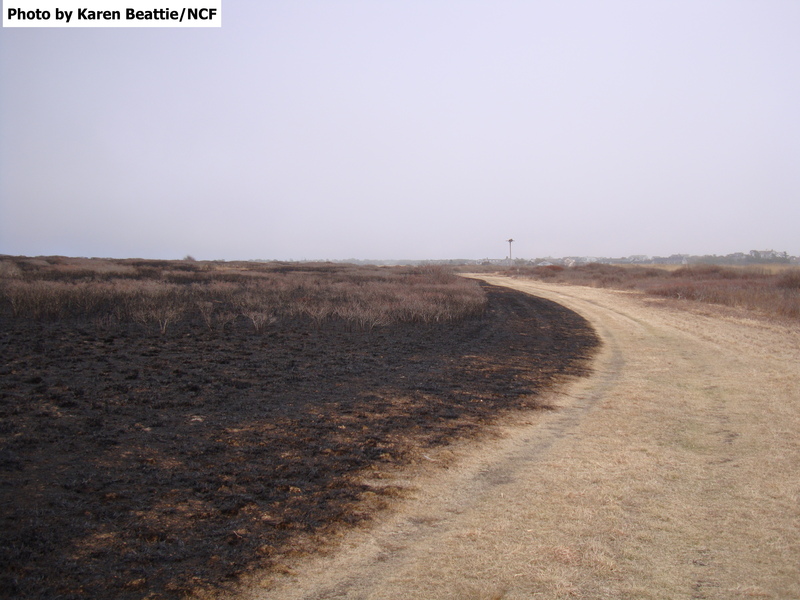 One of these occasions occurred on April 5, 2014 when the Foundation, working with our colleagues and partners at the Nantucket Land Bank, Northeast Forest and Fire Management, LLC, and the Nantucket Fire Department, conducted a prescribed burn on 78 acres of sandplain grassland and heathland habitat in Ram Pasture. This site is located in the southernmost portion of our popular Sanford Farm, Ram Pasture and The Woods property, along the southwestern shore of the island and just to the west of Cisco. When combined with our adjacent Head of the Plains property to the west, this area represents the largest, contiguous acreage of rare grassland and heathland habitats under Foundation ownership. 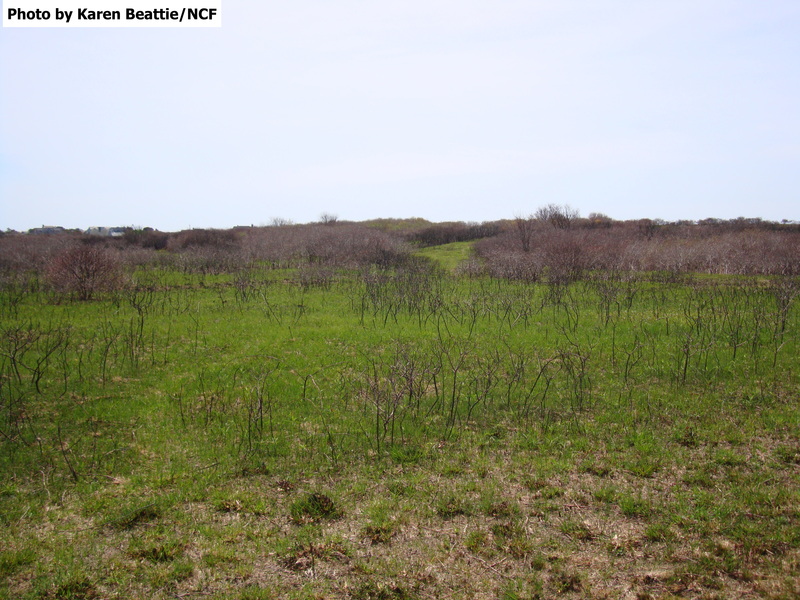 Ram Pasture has been periodically burned and mowed since 1986 and is one of the first locations where prescribed burning was initiated as a management practice on Nantucket. For this reason, it is one of the largest and best examples of ecologically intact sandplain grassland and heathland habitat remaining in the northeastern United States. Due to the hard work and professional efforts of our staff and prescribed fire partners, the burn was conducted safely and effectively achieved all of the land management objectives outlined for this unit. A large portion of the taller shrubs were top killed and most of the grassy patches burned completely, creating exposed bare soil sites suitable for seedling germination. Within a few weeks following the burn, grasses re-sprouted vigorously, triggered by solar warming of the blackened soil surface and the addition of nutrients from ash. If you are looking for a nice spot to go for a walk and enjoy this lovely weather, visit our Ram Pasture property to see the results of this management first-hand by comparing the burned unit to adjacent unburned patches. This area can be accessed from Sanford Farm to the north or through the west gate parking area off Barrett Farm Road (a left turn off Madaket Road just past the bike path water fountain). You can download a trail map at the Foundation’s website or pick one up at our offices at 118 Cliff Road. Happy hiking and happy spring! This entry was posted in Prescribed Fire and tagged land use history, native plants, Natural History, prescribed fire, restoration, sandplain grasslands. Bookmark the permalink.